You are advised to take bus 5, 20, 38, 40, 68, 75, 78, 88, 164, or 301 to Shijiazhuang North Railway Station to catch the first train bound for Niangziguan at 07:00. You will arrive at the destination after less than 2 hours. 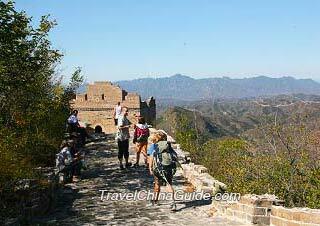 Upon arrival, please walk northeast for 10 minutes to find the ticket office of Niangziguan Great Wall. You are suggested to stroll around the pass city for around one hour and then charter a car for a round trip to Guguan Great Wall. Make sure you get back to Niangziguan Railway Station before 12:00 to catch your onward train to Jingxing. After alighting, take a taxi in front of the train station to Xitumen Village to visit the Jingxingguan Great Wall, also known as Tumenguan Great Wall. After having a good time at the Jingxingguan Great Wall, you may still hail a taxi to the downtown Shijiazhuang to conclude this one-day independent Great Wall hiking tour. Niangziguan means 'Lady's Pass' in Chinese and it got this name because the Princess Pingyang once led the detachment of women to stand guard there during the Tang Dynasty (618 - 907). With wide Taohe River flows by, the pass city was built against the towering Mianshan Mountain and at the edge of sharp precipice, which made it an impregnable barrier to the invaders. Besides the remaining southern and eastern gates as well as the 650-meter-long walls, the residences and lanes inside the pass city are still in their original appearance for visitors to delve into the historical atmosphere. Rising and falling along the hilltop of the mountains, Guguan Great Wall has been around for about 2,500 year so far and is nicknamed as the 'Tiny Badaling' because of its magnificent scenery. Batteries, beacon towers, piers, and outposts were built at important commanding heights along the wall. It is worth mentioning that there is an arch-shaped narrow barbican outside the western gate of Guguan, which provided a double protection for the pass city. Apart from the defensive purpose, Guguan was also an important thoroughfare and the deeply rutted flagstone paths are the best proof of its past prosperity. Jingxingguan used to be a choke point connecting Shanxi and Hebei provinces in the old times and was always of great military importance. Nowadays, there remain three gate towers lined up from the east to the west. 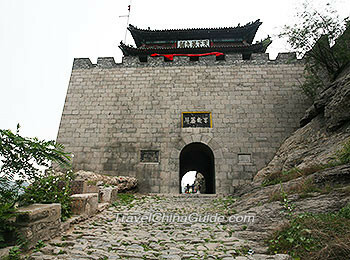 After thousands of years, the gate towers of Jingxingguan might not look as imposing as Guguan and Niangziguan because of lacking of renovations. It perfectly reveals a sense of vicissitudes together with the nearby simple rural buildings.